Enter “Stranger Things 2” (not “Stranger Things” season 2, but “Stranger Things 2”), where we have the added dynamic of new characters, such as the sadistic teen antagonist, Billy, the new doctor who runs the US Department of Energy facility, Dr. Owens, played by Paul Reiser, as well as a new love interest for our beloved characters, Max (short for Maxine). We also, of course, have the return of 11 and all four of our young main protagonists, Sheriff Hopper, and more. We find some of our favorite characters experiencing teenage love, jealousy, and in-fighting that adds to the depth of each character. New concepts are introduced to keep us on the edge of our seats, such as the blurring of the so-called “Upside Down” and our own reality and new creatures (including a gigantic, menacing creature who seems to rule the Upside Down and have the ability to possess minds of humans, whose agenda is “to kill…everyone”). 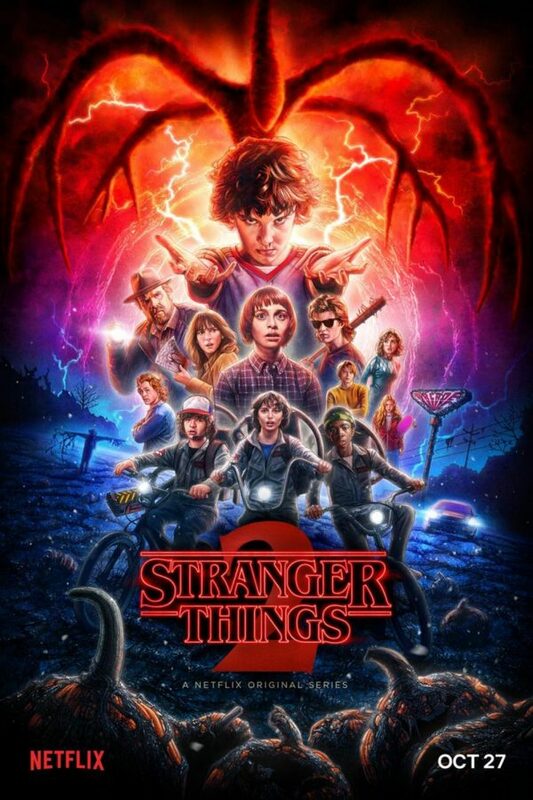 Having grown up on 80’s movies, especially of the sci-fi, horror and adventure kind, it’s no wonder I love this show so much. But does the second season top the first? In my opinion, yes, it does. The nostalgia is a large part of why I love the series. For instance, the characters play classic arcade games such as Centipede and Dig-Dug, and the soundtrack is full of songs such as “Just Another Day” by Oingo Boingo (Danny Elfman’s old band), “Rock You Like a Hurricane” by Scorpions, and many more, that all elicit feelings of being in the 80’s. Why is it better? I would have to say that the atmosphere has grown even more full of depth, the characters are more fleshed out, and we have new threats that are even greater than the first, on a scale that neither the characters, nor we could imagine. Also, the new characters provide a meaningful and interesting additional dynamic. “Stranger Things 2” simply has a feel to it that no other modern show has provided me with. Maybe it’s the blend of 80’s nostalgia with horror and adventure, maybe it’s all the interesting characters and amazing acting, but something about it brings me back to my childhood. I give “Stranger Things 2” a 10/10.